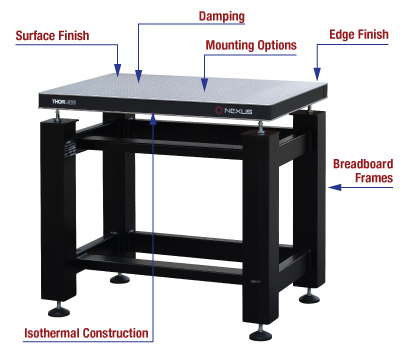 Nexus is a single high-quality grade of tables and breadboards manufactured in various sizes by Thorlabs. They are suitable for photonics, imaging, and microscopy applications and provide quality and vibration isolation performance that exceeds the highest level of our former product line. Each size is individually optimized, and each table ships with a unique test data certificate. See the Vibration Isolation and Construction tabs for more details. 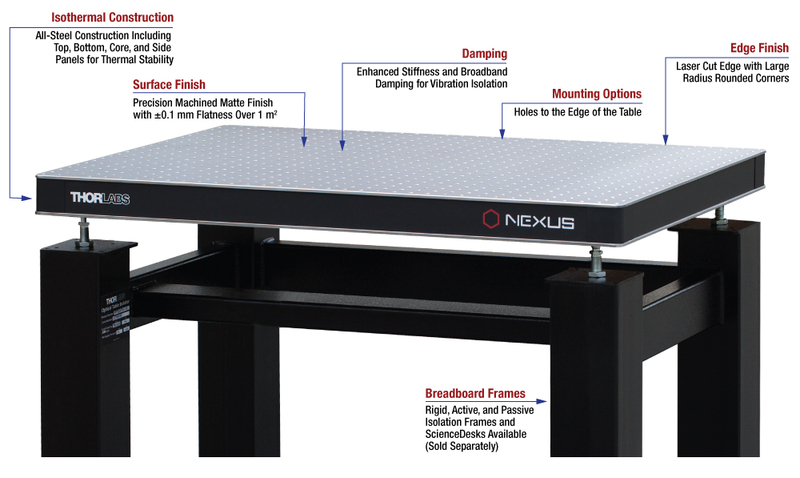 See the Nexus Guide tab for a complete overview of our optical tables product line. Thorlabs' 60 mm (2.4") thick Nexus® breadboards are offered in a variety of lengths and widths from 12" x 12" (300 mm x 300 mm) to 36" x 48" (900 mm x 1200 mm). They feature all-steel construction, excellent thermal stability, and broadband damping optimized for each breadboard size. The 5 mm thick stainless steel top and bottom skins have a matte finish and the top skin is precision-machined with a surface flatness of ±0.1 mm over any 1 m2 area. The breadboard has 1/4"-20 (M6) mounting holes on 1" (25 mm) centers with a 0.5" (12.5 mm) border at the edge of the breadboard. Popular imperial and metric breadboard sizes are stocked in our US and UK warehouses, respectively, for immediate shipment. Custom sizes and options are also available with a typical lead time of 6 - 8 weeks. See the Nexus Guide tab for a complete overview of the Nexus breadboards product line. For a comparison of all our breadboard options please see our BB Selection Guide Tab. We offer a number of support options for breadboards. Our standard Breadboard Frames are available with rigid supports, or with passive or self-leveling active vibration isolation. 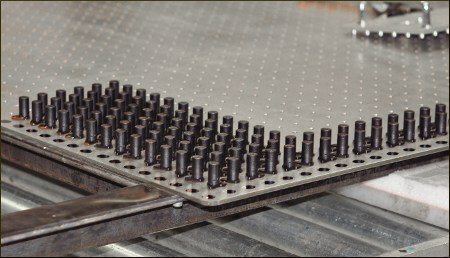 We also offer passive isolator feet for mounting a breadboard on top of a table. Our ScienceDesk™ line of breadboard frames are ergonomic supports optimized for microscopy applications. They are available with rigid, passive, or active vibration isolators, and feature a number of convenient accessories. ScienceDesk frames are available to fit many of our breadboards sized from 2' x 3' to 3' x 4'. B1212F 12" x 12" x 2.4" 22.44 lbs 31.24 lbs 14.9" x 14.9" x 5.5"
B1218F 12" x 18" x 2.4" 33.95 lbs 44.97 lbs 14.9" x 20.5" x 5.5"
B1224F 12" x 24" x 2.4" 43.56 lbs 56.76 lbs 14.9" x 26.7" x 5.5"
B1236F 12" x 36" x 2.4" 62.26 lbs 79.86 lbs 14.9" x 38.6" x 9.0"
B1818F 18" x 18" x 2.4" 48.06 lbs 63.49 lbs 20.5" x 20.5" x 5.5"
B1824F 18" x 24" x 2.4" 62.26 lbs 79.86 lbs 20.5" x 26.4" x 5.5"
B2424F 24" x 24" x 2.4" 80.96 lbs 100.76 lbs 26.4" x 26.4" x 5.5"
B2436F 24" x 36" x 2.4" 122.10 lbs 150.70 lbs 26.4" x 38.6" x 9.0"
B2448F 24" x 48" x 2.4" 162.14 lbs 199.54 lbs 26.4" x 50.4" x 9.0"
B3030F 30" x 30" x 2.4" 133.76 lbs 164.56 lbs 32.2" x 32.3" x 9.0"
B3036F 30" x 36" x 2.4" 156.86 lbs 192.06 lbs 32.3" x 38.6" x 9.0"
B3048F 30" x 48" x 2.4" 204.60 lbs 248.60 lbs 32.3" x 50.4" x 11.0"
B3636F 36" x 36" x 2.4" 184.58 lbs 226.38 lbs 38.6" x 38.6" x 9.0"
B3648F 36" x 48" x 2.4" 239.80 lbs 288.20 lbs 38.6" x 50.4" x 9.0"
The most important feature of an optical table or breadboard is its resonant frequency. Since resonant frequency and vibration amplitude are inversely related, the resonant frequency should be as high as possible to minimize vibration intensity. Nexus tables and breadboards are broadband damped over a specific range of frequencies. For improved performance, the damping is optimized for each size of table and breadboard offered. We have performed extensive testing to optimize the thickness/size ratio of our breadboards. 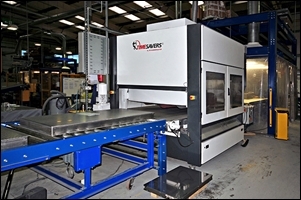 Larger sized breadboards over 5' (1.2 m) long are offered with a standard 110 mm thickness. Smaller sizes are available in both 2.4" (60 mm) and 4.3" (110 mm) thicknesses. The most widely used transfer function for the vibrational response of an optical table is compliance. In the case of a constant (static) force, compliance is defined as the ratio of the linear or angular displacement to the magnitude of the applied force. In the case of a dynamically varying force (vibration), compliance is defined as the ratio of the excited vibrational amplitude (angular or linear displacement) to the amplitude of the force causing the vibration. Any deflection of the tabletop is evident by the change in relative position of the components mounted on the table surface. Therefore, by definition, the lower the compliance value is, the closer the optical table is to meeting the primary goal of optical table design: minimized deflection. Compliance is frequency dependant and is measured in units of displacement per unit force (meters per Newton). See the Vibration Isolation Tutorial for more information on compliance. 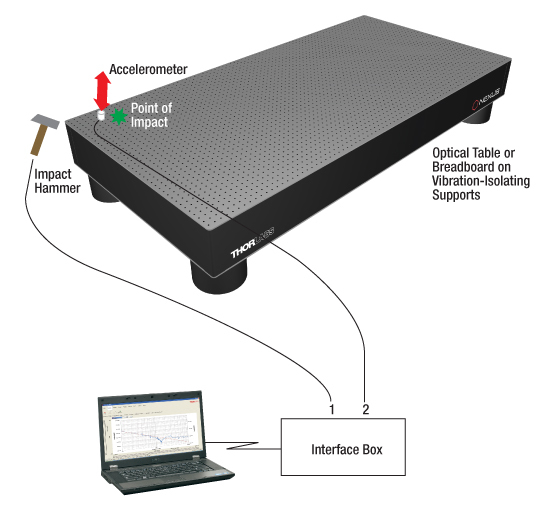 An impulse hammer is used to apply a measured force to the top surface of the table or breadboard, and transducers attached to the surface detect the resultant vibrations (see diagram to the right). The signals from the transducers are interpreted by the analyzer and used to produce a frequency response spectrum (i.e., a compliance curve). During the development phase of an optical table, compliance curves are recorded at many points on the tabletop; however, the compliance is always greatest at the corners. The compliance curves and data published by Thorlabs are taken with the sensor located approximately 6" (150 mm) from the corner of the tabletop (closer to the edge for small breadboards), with the point of impact just inboard of the sensor. This test location represents the worst case data. 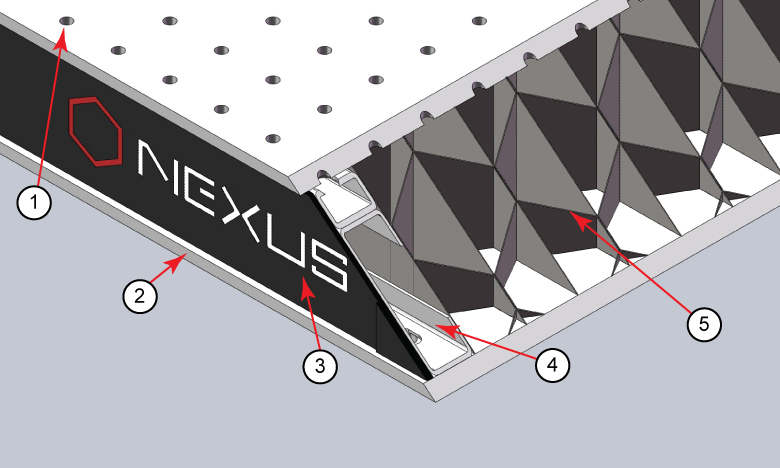 Each individual Nexus product is tested and shipped with a unique test data certificate and compliance curve. This provides more accurate data compared to the industry standard of using a single size-specific compliance curve to represent the entire product line. The compliance curves and data published by Thorlabs are from sensors located on the corner of the table and therefore represent the worst case data. The compliance curves here are typical, and slight variations may occur between individual tables. Each table is individually tested before shipment and includes a certificate with the individual test data and compliance curve (see Unique Test Data Certificate section, above). Note: Compliance data will be available soon for models with a greyed out plot icon. Compliance data is measured for each breadboard, and thus will be included with these models upon purchase. Our team has over 25 years of experience designing optical tables, breadboards, and related accessories. 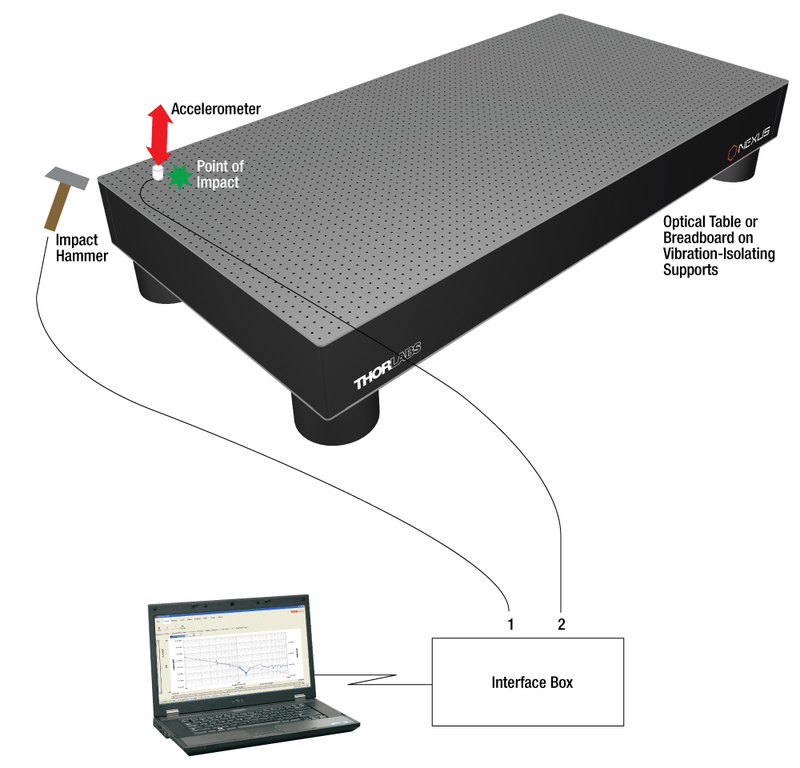 We leverage this experience to ensure that our Nexus® honeycomb optical tables and breadboards always meet two basic design goals: the natural resonances of the table should be as high as possible (well above the frequency of ambient environmental vibrations) and the table should be well damped (to quickly damp vibrations caused by equipment on the surface). To meet these goals, our engineers use a variety of tools to refine their designs, such as finite element analysis (FEA) and SolidWorks. FEA allows our engineers to evaluate various materials and to identify possible unwanted material stresses. SolidWorks is employed to build 3D models of every design. 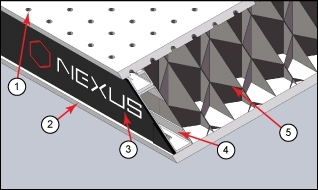 Every Nexus optical table and breadboard is designed to be isotropic and symetrical in X, Y, and Z. For optimal thermal stability, only steel components are used in construction; no wood or plastic is used. Each table includes precision machined top and bottom mounting skins, an uninterrupted honeycomb core, and four side panels with finishing trim. See the animation to the right for a simplified illustration of how our tables are assembled. For more details on each step in the process, read below. 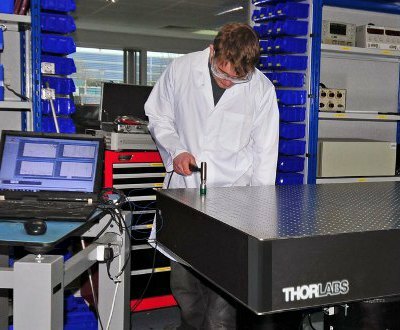 Thorlabs' Nexus tables and breadboards feature all-steel construction, including 5 mm thick top and bottom skins and a 0.26 mm thick precision formed and welded steel honeycomb core. The core is geometrically formed using accurate pressing tools, and geometric pitch is retained by using welded flat shims. 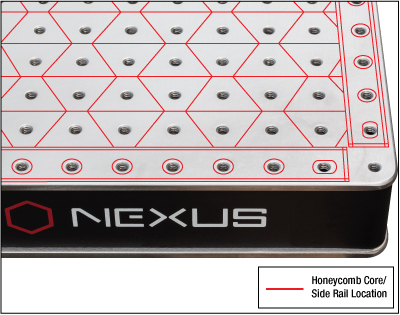 The honeycomb core in our Nexus tables and breadboards extends from the top skin to the bottom skin without intermediate layers, leading to a stiffer, more thermally stable product. 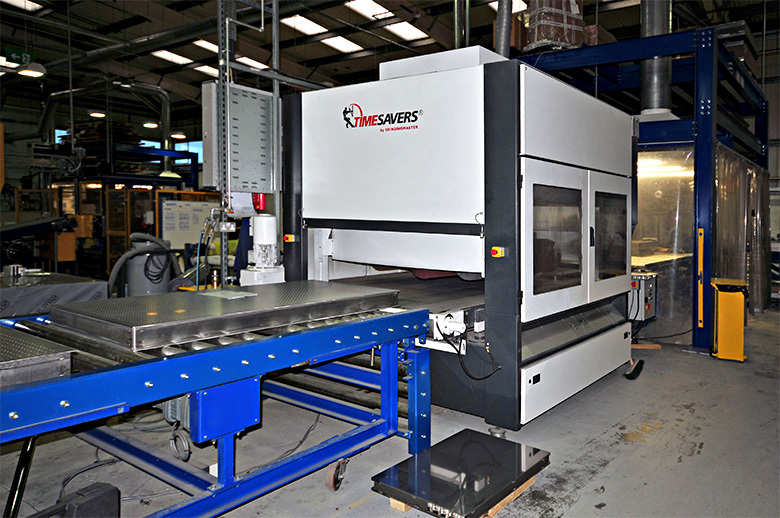 The key aspect of the thermally stable Nexus design is symmetrical isotropic steel construction in all axes. 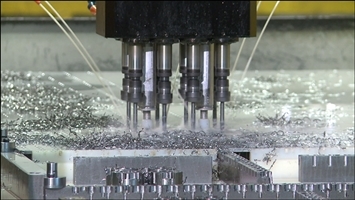 Steel components expand and contract similarly, maintaining flatness during changes in temperature. The steel core extends from top to bottom skin without intermediate plastic or aluminum spill management structures that reduce the overall stiffness of the product and introduce a higher coefficient of thermal expansion. Steel side panels are used rather than wood, which can introduce environmental instability due to susceptibility to moisture. Our Nexus tables and breadboards feature an automated orbital machined matte finish that is significantly smoother and flatter than our previous product line. 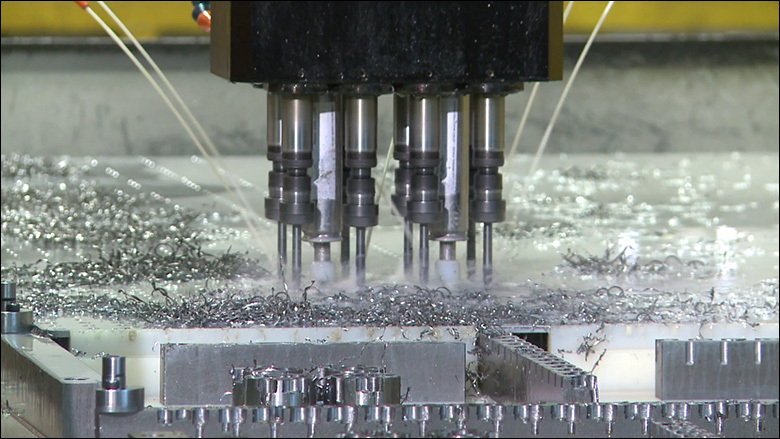 The improved surface finish achieves ±0.1 mm (±0.004") flatness over 1 m2 (11 ft2). Large radius corners are incorporated into the design, resulting in less pointed edges for lab safety. Diagram showing the location of the honeycomb core and side panels, which do not intersect with any screw holes. All optical tables ship with a heat-shrink film that protects the table from most contaminants, such as dust, from entering the product during shipment. For additional protection, we offer an optional finishing and packaging service that is suitable for customers that want to minimize the presence of airborne contaminants on the interior and exterior surfaces of the table or breadboard. This includes anti-static packaging, which has a metallic foil inner layer protected by a heat shrink film outer cover, and gap-free edge panel construction to reduce static charge and prevent dust from entering the product. Prior to bonding the components of the table, each mounting hole in the top surface is tapped and slightly countersunk to ensure that components mounted to the table sit flat. The mounting holes are then cleaned and sealed on the bottom with vinyl film discs (non-sealed models) or sealing cups (sealed hole models, see Sealed Mounting Holes below). The vinyl film is easily punctured when using a hole for the first time. Cap screws can be finger tightened into the mounting holes of all Nexus tables and breadboards. Our top surface hole patterns extend to the edge of the table or breadboard with only a 12.5 mm (0.5”) border, equal to half of a hole-to-hole spacing. This increases the usable area of the table and improves mounting option flexibility. 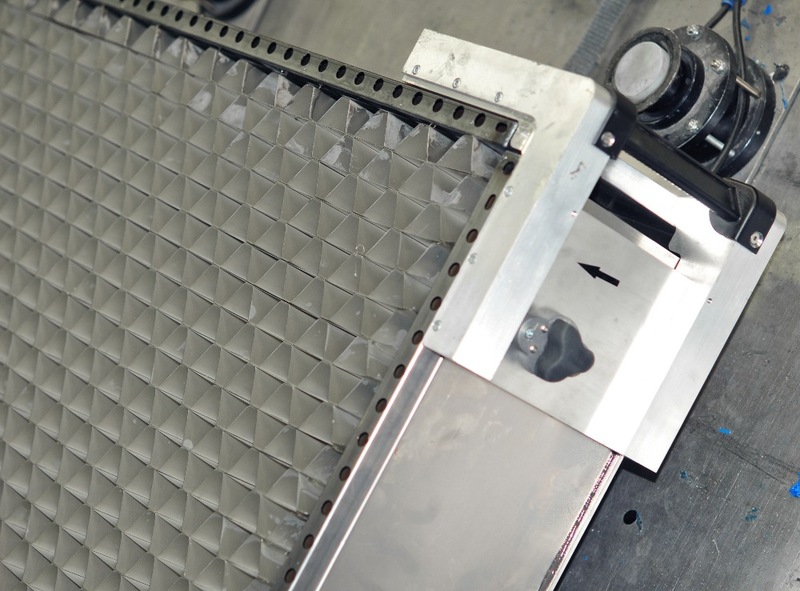 Our custom-designed core maker produces precision formed and welded honeycomb core strips. The core is shaped and installed so that it does not intersect with any screw holes (see photo to the right), allowing screws to be inserted far into the table, all the way to the bottom skin (for non-sealed-hole models). See the Specs tab for specific screw depth specifications, including outer border holes. 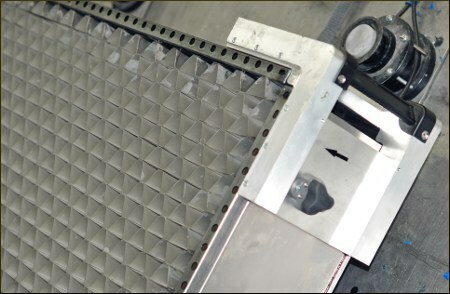 Tables and breadboards can be manufactured with nylon sealing cups glued to the underside of the top skin (see photo to the left) for liquid spill management. Sealed hole tables are available in all sizes and thicknesses, and the maximum screw depth is 1" (25.4 mm). Our breadboards feature at least four mounting holes in the base skin, permitting the secure attachment of standard or vibration isolating feet and allowing more flexibility for integrating breadboards onto tables or into setups in addition to using breadboard stands. The surfaces of our tables and breadboards are sanded in our finishing machine. 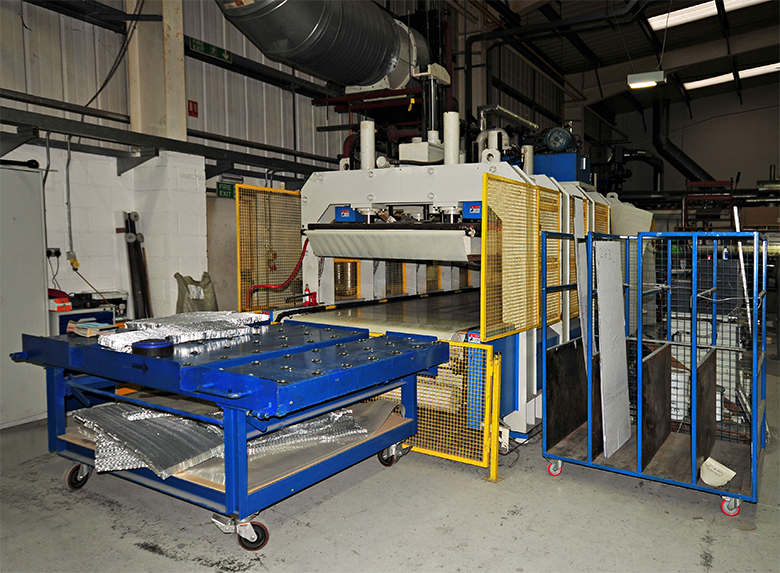 Tables and breadboards are bonded under pressure in our hot press. 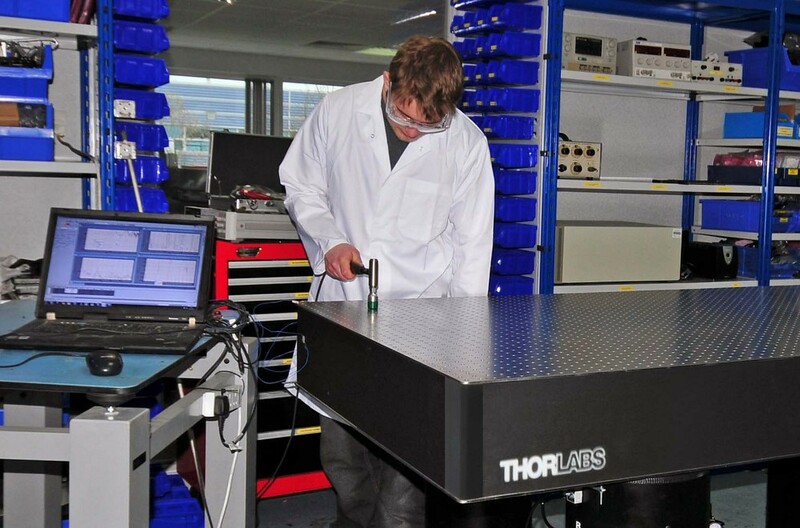 Thorlabs' Nexus line of optical tables and breadboards is the result of our vision to supply a single, high-end-grade line of optical tables for photonics, imaging, and microscopy applications. 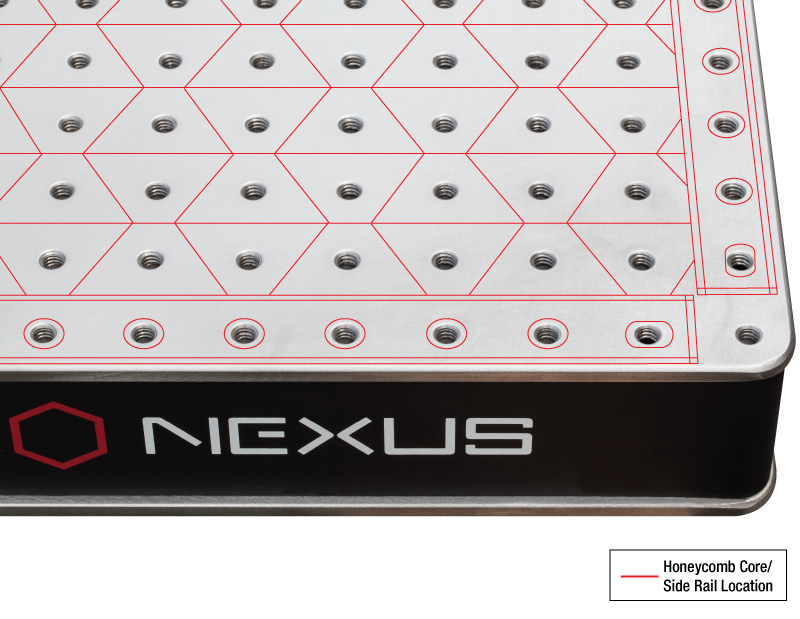 Our Nexus tables and breadboards incorporate enhanced damping, a precision-machined matte top and bottom finish, and holes to the edge of the tabletop. Each product is individually tested and includes a unique test data certificate. Our tables and breadboards are available in many different sizes (see the tables below). Many of these sizes are stocked in our warehouses for same-day shipment, as indicated by green icons in the tables below. Other sizes are available as build-to-order products that can be shipped within 4 - 6 weeks of ordering and are indicated by blue icons below. We also provide a custom table and breadboard service. Common custom sizes are listed by yellow icons in the tables below. Use our Custom Tables and Breadboards Request Form to request a quote on these products. Many table and breadboard sizes are available in two thicknesses, with or without sealed holes. Nonmagnetic steel tables and breadboards, plus table and leg kits, and breadboards with no holes are also available. Click on the green and blue icons below to see the stock and make-to-order tables available in each size. Exact lead times may vary across our product line. Check each individual item for exact lead times. Would placing one of these breadboards directly on a active vibration-isolated tabletop compromise its damping performance? Hello, thank you for contacting Thorlabs. These breadboards are commonly used with rigid, passive, or active isolating supports, so I would not foresee any problems. Hi, What is the frequency range of the damping on the various Nexus breadboards? Is there any compliance data on vibration frequencies below 10 Hz, specifically down to 0.1 Hz? How repeatable are the tables? Can I reliably duplicate mechanical setups within .5mm maybe even tighter tolerance? Edge, hole spread, any deviation? Response from Ben at Thorlabs: Thank you for your question. The top surface of our Nexus breadboard range have hole location tolerances of +/- 0.2mm, i.e from the edge of the top surface, the hole centre will be located between 12.3mm & 12.7mm. 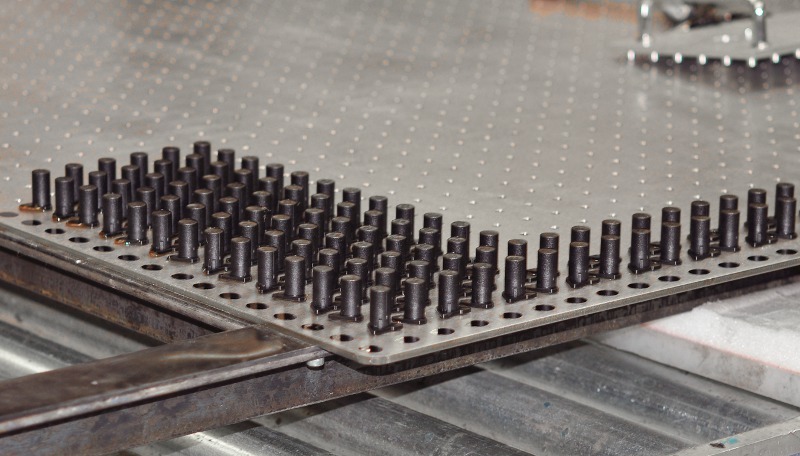 Apart from our rigid rail systems, the majority of our post-mounted solutions do not precisely align to the hole matrix, as flexibility to fine-tune component position is required by many when locating parts on the table. Perhaps if you are seeking tighter tolerances, a custom platform solution would be an option to consider. Hi, Can you give any more information on the density of the different types of breadboard (Nexus vs Intrinsically damped vs aluminium honeycomb). i.e. I would like to compare the mass of the different breadboards but I think the mass is only stated for the aluminium honeycomb breadboards. Thanks! Response from Jeremy at Thorlabs: The weight of each breadboard (packed and unpacked weight) can be found under the "Specs" tab. Response from Mike at Thorlabs: The B4560A breadboard contains ferromagnetic steel in most of its construction. We do have a range of breadboards made from non-magnetic 304L steel http://www.thorlabs.de/newgrouppage9.cfm?objectgroup_id=1084 or our ultra-light aluminium breadboards http://www.thorlabs.de/newgrouppage9.cfm?objectgroup_id=1877 if you are looking for a non-magnetic option.